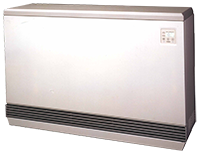 Steffes Electric Thermal Storage (ETS) room heating units provide clean, consistent heat for rooms of nearly any size. Our 2100 Series room units are ideal for retrofitting electric baseboard-heated rooms, supplementing an existing heating system or heating a new addition to your home or business. Unlike traditional electric heaters, Steffes ETS room heating units convert electricity to heat during off-peak hours, when the demand and price of electricity is lower. Specially-designed ceramic bricks within our units store vast amounts of heat for extended periods of time so you can save money without having to shiver. With the built-in room thermostat, you can adjust the heater’s temperature settings for clean, consistent heat that meets your comfort requirements. Contact a dealer in your area for help determining which size and model is right for your room.